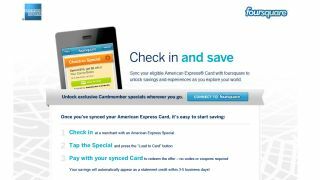 American Express and Foursquare have teamed up to provide what it is describing as an 'effortless' voucher system for location based offers. Interestingly, people who take advantage of the offers will not have to actually show anything – a voucher, code or even their mobile – to the cashier, with saving credited back to the Amex within 5 working days. The people involved in the offers include Bella Italia, Café Rouge, Eat, House of Fraser, Nando's, PizzaExpress, Primark, Strada and Tesco. According to American Express, this announcement is just part of a strategy to 'digitise its core assets' and integrate social technology into its core. "The partnership with Foursquare underscores our focus on digital innovation aimed at delivering added value to our Cardmembers and merchant partners," said Colin Walsh, Managing Director, American Express UK. "Our customers want the best deals at their convenience. They are increasingly connected online and when it comes to shopping they are actively seeking real-time offers that generate savings, while merchants are keen to embrace the benefits that smartphones can bring them. "We're excited to be taking this one step further by marrying our digital capabilities with Foursquare's leading edge application to deliver voucher-less offers from so many popular high street brands. This is a first for our UK Cardmembers."